The Hayden 3 tent is a reliable and practical, dome tent with pre-shaped poles to provide optimised interior space for maximum comfort on the campsite. The Hayden’s stable dome structure features an innovative design with entrances at both the front and the back for increased convenience. Gear can be stored in both of the porches to keep the tent organised. The larger front porch includes PVC windows to allow light inside and also a durable PE groundsheet that is attached to the flysheet to keep wet weather at bay. 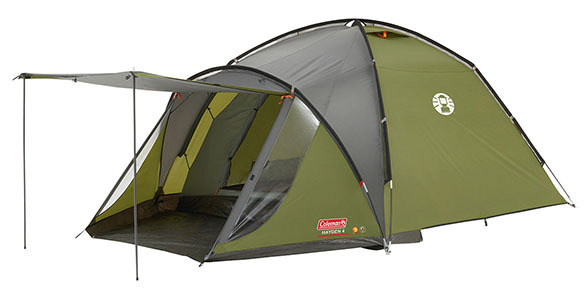 The large bedroom easily accommodates 3 campers while pockets and a lantern loop help ensure kit is easy to keep tidy. Easy to pitch thanks to its color-coded poles, the Hayden 3 features pre-shaped and wind-responsive poles to ensure the tent stands strong in windy conditions. Wet weather is no match for the durable, PU-coated flysheet with a hydrostatic head of 3000mm. Reflective guylines help reduce the risk of tripping and the Hayden 3’s flysheet is treated with Coleman’s UV Guard™ for protection against the sun’s rays. All fabrics are fire retardant for peace of mind.